Vote Baby Groot for the Canstruction Chicago People’s Choice Award! Please Vote, Like & Share! Vote Baby Groot for the Canstruction Chicago People’s Choice Award! http://wshe.es/jG59z9Ed. Voting closes THIS Wednesday at 8pm! SM&W Chicago partnered with Wight & Company to participate in CANstruction – an exhibition of structures made from unopened cans of food. 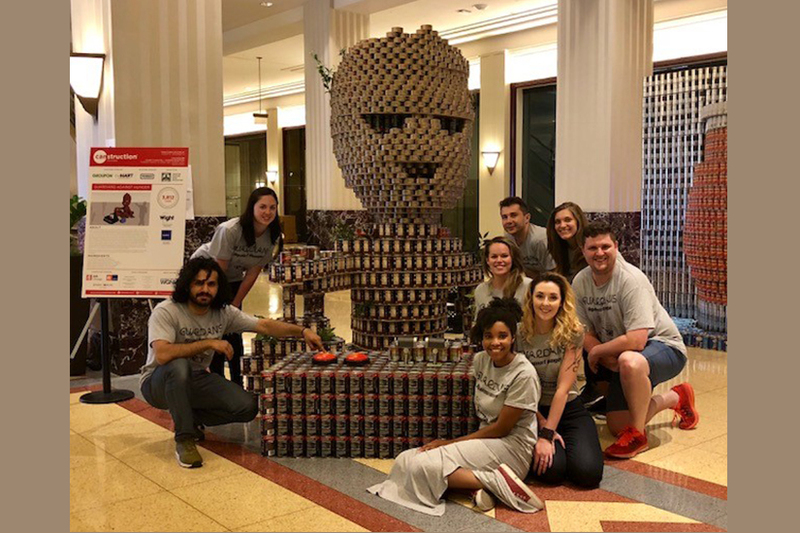 Our sculpture of Baby Groot from the Avengers is made out of 4325 cans which will be donated to the Greater Chicago Food Deposit next month. We truly appreciate all canned food donations; this food will help feed many in need. *Baby Groot is on display at the Chicago Merchandise Mart until 9/9. If you follow the story, you know Big Groot eventually becomes Baby Groot – a re-planted and re-grown version who turns on speaker systems and dances while his Guardian of the Galaxy teammates fight villains of evil. When push comes to shove, the survival of the galaxy, and mankind as we know it, depends on making sure Groot pushes the right button. Much like how Baby Groot is placed in timely situations where choosing wisely is instrumental, so should we when it comes to battling against hunger. Some 795 million people in the world do not have enough food to lead a healthy active life. That’s about one in nine people on earth. The vast majority of the world’s hungry people live in developing countries, where 12.9 percent of the population is undernourished. In the Cook County suburbs, the average rate of food insecurity is estimated at 15.4 percent.